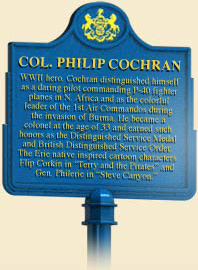 Col. Philip Cochran, commander of the First Air Commando force, 1944. During World War I, the acrobatic and deadly aerial duels of high-flying pilots gripped the imagination of people on both sides of the Atlantic. In the decades that followed, the exploits of pilots were celebrated in motion pictures, novels, and comics, including "Terry and Pirates," a popular strip based around the exploits of Terry Lee, a dashing young world adventurer, created in 1934 by cartoonist Milt Caniff. Born in Erie, Pennsylvania, in 1910, Phil Cochran wanted to play football but was too skinny, so he made his way through Ohio State by waiting tables and singing in dance bands. After his 1935 graduation, Cochran found that his business degree earned him no job during the Depression, so he entered the Army Air Corps because "it looked like a good way to make a pretty easy living." And, at $75 a month, he earned more than a lot of people did in those days. Cochran soon developed into a first rate pilot. When the United States entered World War II, Cochran was assigned to a P-40 fighter squadron based in Connecticut. Early in 1941, Cochran approached Milton Caniff, whom he had known at Ohio State, and asked him to design an insignia for the 65th Fighter Squadron group. Some months later, while watching Cochran and other pilots practice fighter airplane maneuvers near Groton, Connecticut, Caniff realized "what potential material they were for Terry characters." After America's entry into World War II, Caniff had Terry join the United States Army Air Forces. On August 3, 1942, he gave Terry a new companion, the swashbuckling Captain Flip Corkin, whom he based on fellow Buckeye and real life hero: Lieutenant Philip Cochran. Cochran was soon at the front, having been assigned to lead a group of replacement pilots and planes to North Africa. 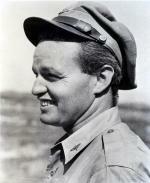 Cochran's group seemed forgotten in the mass confusion after the landings; wanting to see action, Cochran took charge of his recruits and took off in pursuit of the war, eventually settling into a small airfield in southern Tunisia. With no unit designation–his men called themselves the "Joker Squadron"–and using British equipment and repairmen, Cochran's ragtag outfit took to the air, fighting German and Italian pilots, bombing ground units, and earning a reputation as a hard-fighting bunch of pilots. Even though he was an officer, Cochran fraternized with his pilots and considered them friends, which endeared them to him even as they respected his leadership. His deputy commander recalled that Cochran was "a colorful individual, a natural leader. He was aggressive, but not ambitiously so." American correspondents latched on to the colorful leader and soon his name was appearing in headlines around the country. His success also fueled a local war bond drive in Erie that netted more than $15 million in just over a month. Back in the states to train pilots after the conquest of North Africa, Cochran was ushered into General "Hap" Arnold's office for reassignment. Arnold, Commanding General of the U.S. Army Air Forces, wanted Cochran and his buddy John Alison to form a new air group to provide support for British forces, known as the "Chindits," who were in India preparing for the invasion of Burma. Under the command of Orde C. Wingate, another unorthodox leader, the British were preparing to push the Japanese out of Burma, but needed air cover. Cochran and Alison were tasked with providing it. Thus was born the 1st Air Commando Group, comprised of fighters (P-51 Mustangs at first), B-25 bombers, helicopters, cargo planes (the big C-47s), and gliders. Wingate's method of attack–long-range penetration–demanded special tactics. Using the gliders as attack aircraft, Cochran and Alison would fly behind enemy lines during in the initial waves of troop offensives, using jungle clearings as primitive airfields to enable the British and Indian troops to clear a larger area for the bigger transport planes to land. Naysayers abounded, telling Cochran that gliders could not be used in the jungle. But Cochran's infectious optimism helped Wingate get through the tough times in early 1944. Lord Louis Mountbatten, the Allied theater commander, once informed Cochran that "you are the only ray of sunshine we have had in this theatre this year." When Project Nine got off the ground, Cochran's last-minute reconnaissance revealed that one of two clearings was impassible. Even so, the operation proved a resounding success, when 9,000 troops landed 165 miles behind the Japanese front lines. Wingate's interior raiding helped rout the enemy from Burma and pave the way for better supply lines to China. Following the end of World War II, Cochran returned to the United States, worked as a historical advisor to Hollywood filmmakers, and then came home to Erie. Here, he obtained a position in his brother's business, Lyons Transportation Lines, became actively involved in local charities, and assisted in the development of Gannon College. Cochran died in 1979 of a heart attack while fox hunting in New York. Speaking after his death, Milt Caniff said that Cochran "had class. Nobody can ever define it, but you can sense it. He had the ability to always do and say the right thing at the right time. … Some people naturally rise above the crowd. He was one of them." William Ericsson, "Colonel Phil Cochran . . . A Final Salute," Erie Magazine (October/November 1979): 8-11.